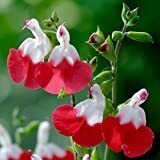 Salvia hot lips growing shrub‎ of the genus Salvia also known as Baby sage, Salvia hot lips perennial evergreen used as ornamental fragrant plant, can grow in subtropics, mediterranean, temperate climate and growing in hardiness zone: 9-11 (as perennial) 5-8 (as annual). Leaves fragrant in color green the shape ovate to elliptic. Flower color can be: pink with white, the flower shapes its dancer body with dress, flowers change the color by the temperature in hot temperature the flower mostly with one color in spring and autumn can be in bicolor.